In 2016 Greece made a significant economic adjustment, which was a result of extensive fiscal consolidation and implementation of reforms. In 2017, the GDP amounted to €317.4 billion, the gross public debt amounted to 178.6 per cent of its GDP and there was a surplus of 4.2 per cent. Growth was at 1.4 per cent, while it is expected to reach 1.9 per cent in 2018. On the negative side, the enormous sacrifices and the internal devaluation had a strong impact on society, thus impairing poverty and unemployment rates, which reached 35.7 per cent and 20.9 per cent accordingly. Key reforms include improving of fiscal figures, restoration of the banking sector's growth, through reduction of non-performing loans and debt restructurings, introduction of collective dismissals, opening-up of closed professions and boosting of investment and privatisations. There is a debate between European institutions and the International Monetary Fund (IMF) as to whether the Greek debt is sustainable. On the one hand, a majority of the European institutions claim that the debt is sustainable and there only needs to be some technical readjustments of the loan agreements. On the other hand, the IMF reiterates the need for a debt relief, which will be complemented with strong policy implementation in order to restore growth and sustainability.2 Nonetheless, European institutions are reluctant to proceed with a second debt haircut, partly because of the Treaty of the Functioning of the European Union3 (no bailout clause) and partly because this would demonstrate a special and favourable handling of the Greek debt, in comparison with the handling of other Member States' debts. Moreover, the banking sector is on a close watch, as the three recapitalisations and the ongoing liquidity support from the European Central Bank and the Bank of Greece have not been enough to enforce financial performance. Following issuance of a legal framework4 on the establishment and operation of credit servicing firms by the executive committee of the Bank of Greece, banks have become very active on taking measures to handle NPLs as well as NPEs, such as implementing internal procedures or outsourcing such services to third parties. This activity can also be attributed to the recent legislation5 that releases managers, directors and any other person entrusted with the management of a banking institution's estate from any liability arising therefrom within the scope of a restructuring, rehabilitation, special administration procedure or haircut of debts and claims. Finally, provision of financial support has also been relatively low, making it thus very hard, if not highly unlikely, for small and medium-sized enterprises (SMEs), which dominate the Greek economy, to gain access to financial help from the banks. An exception to this practice is lately noticed within the scope of a restructuring procedure, in which case the banks rely upon a well drafted business plan and are more willing to proceed with a refinancing of the existing debts, especially in view of the preferential ranking of claims arising from such agreements. Undoubtedly, 'Brexit' (after the referendum in United Kingdom regarding its membership in the European Union) has created new conditions. While it is very hard to quantify the exact consequences, both political and financial, of this event, no one can claim that this will be an easy path for either side. A first estimation is that Brexit will have a great impact on immigration, as the United Kingdom shall be able to restrict immigration from Europe, depending on its future relationship. It is likely that Britain will restrict the number of low-skilled workers entering the country and will focus more on highly skilled workers. In any case, Britain will design specific and probably strict migration requirements that will affect Greece, as many highly skilled Greek workers have moved to the UK. On the other hand, this could be a good outcome for Greece as they will contribute their know-how and thus, help Greece increase its competitiveness. Among others, trade and manufacturing as well as financial services will be affected, since Britain will be considered a third country, and, thus, tariffs shall be imposed on imports and exports. Regarding financial services, Britain may also lose its 'passporting rights', which currently allow UK-based institutions to provide services to the European Union without having a branch in another Member State. The loss of such rights may lead UK-based banks to establish a subsidiary in the European Union in order to process business there regardless of the fact that such work may be essentially done in London.6 Such outcome could also be positive for Greece and its maritime economy, as many shipowners cooperate with British banks and could lead to an increased presence of British banks and bank services on Greek territory. Despite Brexit, and contrary to what many analysts and journalists had reported, the Netherlands was not another domino that fell to populism, and the staunchly anti-Islam, anti-EU and anti-immigration PVV party of Geert Wilders lost the elections. The same happened in the French presidential elections, in which Emmanuel Macron and his party, who are seeking EU reform as well as deeper European integration in the form of a eurozone budget and eurozone finance ministers, won, thus keeping alive the European dream. While many were afraid that Europe would crack under the test of all the upcoming European elections, it seems that anti-populism and sanity make slow but steady victories. It is likely that this will also happen in the German elections. It goes without saying that all these political events do affect Greece, both in terms of its membership and role in the European Union and the handling of the Greek debt. Apart from the economic recession, Greece is struggling under the weight of what is perhaps in its recent history the largest refugee crisis in scale. Greece has become a country of entry and transit for hundreds of thousands of refugees from the Middle East. It is estimated that 1.03 million people have entered Greece since 2015, of which at least 57,000 are stranded in Greece after the closure of the borders on March 2016. Consequently, Greece is also grappling with a huge number of asylum applications and an ineffective immigrant detention system, both of which entail high administrative costs and expenditures that Greece cannot afford. The refugee crisis has had a deleterious effect upon the political environment and has raised questions about how the refugees will be integrated into society, public schools and the public health system. Undoubtedly, this will be a substantial budgetary cost for Greece, which is difficult to address owing to fiscal and budgetary adjustments. A large number of medium-sized companies proceed with informal and out-of-court restructuring following a mutually agreed business recovery scheme with the banks, under which the banks have become involved or take over the debtor's management and look for a potential investor. This is heavily applied to outward-looking companies that have increased exports activity, such as those of the aquaculture industry, or those that have good potential to remain sustainable and regain their profitability because of their financial contribution to the Greek market, such as companies in the food industry (mainly supermarkets). Small companies usually apply for a formal restructuring procedure, which is typically a longer and costlier process. Although the competent authorities do not regularly issue a report regarding the insolvency statistics, the Hellenic Statistical Authority recently published some figures referring only to the bankruptcy procedure and for the period of 2004–2014. According to these statistics,7 the average number of companies that applied for a bankruptcy procedure each year during the said period, amounts to 1,061. Of these petitions, 914 (86 per cent) were accepted and 457 bankruptcies were declared. Moreover, of these statistics, 42 per cent concerns sole proprietorships, 11 per cent partnerships and 47 per cent entities limited by shares. The most bankruptcies have been recorded in the industry of retail and wholesale (45.7 per cent), the industry of manufacturing (22.8 per cent), the hotel and food services industry (11.6 per cent) and infrastructure industry (5 per cent). Unfortunately, there are no formal reports regarding the number and course of bankruptcy applications. It is estimated that the time required to resolve insolvency cases is three-and-a-half years, and the recovery rate is 35.6 per cent. More than 16,000 SMEs closed in 2015, while 229,000 SMEs closed within the period 2008–2014. In the first half of 2017, 16,384 businesses were registered and 14,138 were deregistered, creating a positive result again. introduction of a more elaborated legal framework for the sale and management of NPLs and NPEs. Regarding the formal procedures exited, it should be noted that the (once more) reformed Bankruptcy Code has abolished the process of initiating a restructuring procedure with an initial period, during which the debtor and his or her creditors would negotiate with the participations of a mediator, in order to reach a compromise agreement. This abolishment emerged from the fact that many debtors fraudulently and tediously initiated this process in order to secure suspension of enforcement, but in reality, they had no intent to reach a compromise agreement with their creditors. Thus, the restructuring procedure is now effectuated only with a pre-pack deal, namely an advance compromise agreement that is submitted before the court, for its ratification, together with the petition for the opening of the process. Moreover, the new Bankruptcy Code has abolished the special liquidation procedure, as its practice had been very limited. The explanatory report of the new law provides two reasons for the abolishment of the special liquidation procedure; the first refers to the existence of a very similar process, which is the special administration procedure of Law 4307/2014, and the second refers to its nature, namely the fact that it addressed very specific needs and thus, it was subject to continuous amendments that are not congruent with the objectives of a codified Bankruptcy Code. Greece has greatly focused on corporate insolvency law since 2007. The Bankruptcy Code has been updated many times since then, in reflection of the financial challenges faced by Greek corporations. Bankruptcy proceedings can be initiated by or against a merchant, either as an individual or as a legal entity. Corporate Insolvency law in Greece (Law 3588/2007)8 is structured in three main pillars: (1) voluntary liquidation; (2) involuntary liquidation; and (3) the restructuring procedure. Once the court declares the legal entity bankrupt, the entity is placed in receivership. For this, the court appoints an insolvency practitioner (syndic or bankruptcy trustee) to start the liquidation proceedings and manage the legal entity's assets and liabilities. The court may also appoint the legal entity's management body (debtor in possession), which shall manage its assets and liabilities, along with the insolvency practitioner, and until the union of the creditors, granted that such appointment is in the interests of the creditors. The court, moreover, designates the date12 and place whereby the creditors shall convene before the judge rapporteur13 to discuss about the debtor's financial condition and sustainability, the reasons for bankruptcy, the perspectives to maintain the debtor's business and to file a reorganisation plan, as well as the probable outcome for the satisfaction of creditors. The court, finally, designates the date14 that the present cessation of payments occurred, which cannot be more than two years prior to the date of declaration of bankruptcy and in the event of imminent cessation or probability of insolvency is the date of publication of the bankruptcy's declaration. the suspension of all individual enforcement actions and proceedings, either future or existing, against the entity and its legal representatives. The entity may file a reorganisation plan, in the case of present or imminent cessation of payments, but if insolvency is probable then the entity is obliged to file a reorganisation plan along with its bankruptcy petition, or within three months of its declaration of bankruptcy. The creditors, who represent 60 per cent of the total claims, including 40 per cent of secured creditors, may also file a reorganisation plan in case of permanent cessation of payments. The reorganisation plan must provide information regarding the corporation's financial situation, a description of the current or future measures to be taken to secure satisfaction of creditors, and the creditors' rights and legal status. Moreover, it may be subject to modifications and may now include provisions on the sale of the entire or part of the business. Similarly, to the restructuring procedure, the special mandator (appointed by the court in such cases) is entitled to substitute shareholders or stakeholders that deny their presence or vote for decisions that are required under the reorganisation plan applies here. Finally, the court proceeds with a pre-review of the reorganisation plan within 20 days from its submission and if it is not rejected, either for typical or substantive reasons, it is subjected to the creditors' approval within two months from the court's order. Approval of the reorganisation plan requires a majority of 60 per cent of the total claims, which includes 40 per cent of secured creditors. Then the reorganisation plan is ratified by the court and has a cramdown effect, thus binding all creditors, regardless of their participation or consent. Involuntary liquidation is commenced either by any creditor with a relevant legitimate interest in case of present cessation of payments, or by the prosecutor for reasons of public interest (very rare in practice). The time and procedure of filing are the same as those of the voluntary liquidation. Moreover, creditors who represent 60 per cent of the total claims, which include 40 per cent of secured creditors, may also file a reorganisation plan along with the bankruptcy petition. Following the pre-review of the plan by the court and before the commencement of the voting by the creditors, the entity (debtor) must approve the plan. Any objections raised by the entity do not prevent ratification by the court, if the court believes that the plan will not impair the legal status of the entity. 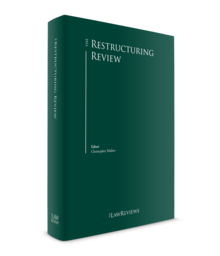 The restructuring procedure15 is a pre-bankruptcy procedure that aims to restart and 'rescue' an entity's going concern, while safeguarding creditors' best interests. An entity in cessation of payments or approaching the imminent cessation of payments, or even probable insolvency (estimated as such by the court), may submit for ratification before the court a creditors' compromise agreement (pre-pack deal), which must be approved at least by the supermajority (60 per cent) of the creditors, including 40 per cent of secured creditors. The procedure of initiating a restructuring, during which the debtor and his or her creditors would reach a compromise agreement has been abolished, in order to avoid fraudulent actions by the debtors. The new Bankruptcy Code provides that from the date of the pre-pack deal submission until the issuance of the court's decision, all enforcement actions against the entity are automatically suspended for a maximum period of four months. Such automatic suspension can occur only once for each debtor. Nonetheless, the court may accept any further provisional measures, following a respective petition by any person with legal interest in the case. An innovative provision of the new Bankruptcy Code states that both automatic suspension and any further provisional measures may take place even before submission of the creditors' compromise agreement for ratification if: (1) the petitioner produces a written declaration signed by creditors, representing at least 20 per cent of the total claims; and (2) the conditions of an emergency or imminent danger of the parties are met. Such measures shall be in force until the submission of the pre-pack deal and in any case for four months from the court's respective order. It is noted that no extension of such measures can be ordered. Until now, only the debtor could submit a pre-pack deal. The new Bankruptcy Code provides that creditors may also submit a pre-pack deal, without the debtor's consent, if: (1) such deal is executed by the supermajority (60 per cent) of the creditors, including 40 per cent of secured creditors; and (2) the debtor is under present cessation of payments. In this case, the creditors must also file a petition for bankruptcy. the restructuring plan along with the business plan is disclosed to all non-participant creditors whose claims may be affected by the restructuring plan. Furthermore, the new Bankruptcy Code introduced a new role for the special mandator. The court could also appoint a special mandator, who is responsible for certain actions, the safeguard of the debtor's property, etc. Currently, in the case of a pre-pack deal, owing to present cessation of payments, the special mandator appointed by virtue of the ratification decision, is entitled to substitute any shareholder or stakeholder in the respective meetings, if such shareholder or stakeholder: (1) denies his or her participation or vote for the approval of actions required under the pre-pack deal either after its submission or as condition precedent; and (2) it is probable that he or she shall not participate in the liquidation proceeds. The special mandator shall exercise the aforementioned rights granted that the shareholder's declared abstention or negative voting impairs the quorum and majority percentages. The same right (along with its limitations) applies in all other cases of a pre-pack deal ratification, if abstention or negative voting by the shareholder or stakeholder is a result of abusive behaviour. Special administration procedure is provided under Law 4307/2014. It is mainly a 'weapon' for creditors to take over the business of their debtor in order to sell the entire business or its assets and satisfy their claims with the proceeds. So far, only three entities have been subjected to special administration. In fact, any entity in cessation of payments or in case of a company that meets, for two consecutive fiscal years, any of the conditions for judicial dissolution, under Article 48 Paragraph 1 of Codified Law 2190/192016 can fall under the special administration procedure, following a petition of its creditors, including a credit institution, representing at least 40 per cent of the total claims. The petition must also be accompanied with a declaration by the proposed special administrator, accepting his or her appointment. The special administrator has 12 months to complete the process, unless at least 90 per cent of the total assets have been sold and the special administrator thinks that based on the announcement of claims, the proceeds suffice for their entire satisfaction, in which case he or she may request an extension. Otherwise, the special administrator must file for a bankruptcy petition. It should be noted that in light of the abolishment of the special liquidation procedure, the special administration is the only similar alternative, and, thus, it should be reformed in a way that expands its scope and serves more efficiently its objectives. The Code of Civil Procedure provides that the court may impose a special administration upon the real estate property or even the business of the debtor, following a creditor's petition. Such an order is issued only if the creditor's claim is judicially verified and thus, the creditor has obtained a respective decision allowing him or her to enforce his or her claim against the debtor. It should be mentioned that this procedure is not acknowledged as an insolvency or liquidation procedure, but as an alternative means granted to the creditor to satisfy his or her monetary claim. These provisions are not largely regulated, and thus, initiation of such procedure is not widely recorded. It appears that special administration is more applicable to very small businesses or merchant individuals. Nonetheless, in 201317 a large construction company was the first-ever debtor to be placed under special administration, following the respective petition of a minority creditor. As the court explained in its headnotes, courts may not impose a special administration upon a real estate property or business of the debtor if, among others, there are compelling reasons for not doing so. Compelling reasons are those that render the special administration unprofitable, that the business's operation and success is closely related to the personal reputation and contribution of its managers or partners, or that the business's operation falls within the provisions regarding the protection of trade secrets. On 5 February 2016, the Greek legislator abolished all the provisions18 that applied to insurance companies, by virtue of Law 4364/2016 (the Law). The Law is in compliance with Directive 2009/138/EC, regarding the undertaking and operation of insurance and reinsurance companies. According to the Law, such companies are required, as an integrated part of their business strategy, to maintain tools to proceed with a regular practice of assessing their overall solvency needs. The results of each assessment should be reported to the supervisory authority, which is the Bank of Greece. The new provisions aim to create a trustworthy environment and minimise unexpected liquidations of insurance companies that have severe financial and social results. In this respect, Article 235 of the Law provides that insurance companies are not subject to the rules of bankruptcy or pre-bankruptcy proceedings. As such, the Bank of Greece is the only competent authority to decide on the revocation of its licence as well as on the restructuring measures for an insurance company, including the rise of capital, mandatory transfer of portfolio, suspension of payments to third parties etc., as well as on the winding-up proceedings following the suspension of their licence. In the case of winding up, the priority of claims is as follows: (1) employees' claims arising from employment contracts and employment relationships; (2) claims of the state arising from due taxes; (3) pension funds claims; and (4) claims on assets subject to rights in rem. According to the new rules on credit institutions, Article 145 Paragraph 1(a) of Law 4261/2014 provides that, subject to the specific provisions of Law 3458/2006 on Restructuring and Liquidation of Credit Institutions, such undertakings are not subject to the rules of bankruptcy or pre-bankruptcy proceedings. To this extent, Law 3458/2006 provides for a special liquidation procedure that may be voluntary or involuntary. In any case, if the Bank of Greece suspends the licence of a credit institution, then such undertaking is immediately placed under involuntary liquidation. There are a number of laws applying to investment companies, depending on their nature and the investment services provided. Thus, Law 3606/2007 applies to investment services firms and investment intermediation firms, Law 3371/2005 applies to portfolio investment companies, Law 2367/1995 applies to closed-end investment companies, Law 2778/1999 applies to real-estate investment companies and real-estate mutual funds, Law 2992/2002 applies to venture capital funds, Law 4367/1995 applies to venture capital companies, Law 4099/2012 applies to undertakings for collective investment in transferable securities (UCITS) and their managers and Law 4209/2013 applies to alternative investment funds and their managers. In general, investment companies can be declared bankrupt, subject to explicit provisions of the law that require a specific liquidation procedure supervised by the competent authority. In this respect, Article 22 of Law 3606/200719 provides that a bankruptcy proceeding may be suspended if the Hellenic Capital Markets Committee revokes the licence of the company concerned (for reasons provided in Article 21 of Law 3606/2007), then a special liquidation procedure is commenced. It should be noted that Article 2 Paragraph 3 of Law 3458/2006 on Restructuring and Liquidation of Credit Institutions, as amended by Law 4335/2015,20 also applies to investment companies that are established as parent companies in Greece and that have subsidiaries in another Member State. It remains to be clarified whether this new amendment, which provides for a restructuring procedure rather than bankruptcy and liquidation, shall be applied to investment companies established as parent companies in Greece that do not have any subsidiaries in the EU area. Individuals that are not merchants are exempted from bankruptcy proceedings and fall under the protection of Law 3869/2010, which introduced measures to protect financially distressed individuals and households, such as extension of payments, increase of the number of payment instalments and deletion of debts. The debtor must file a petition before the Peace Court satisfying all statutory requirements, including a detailed certificate of debts, the status of personal assets and income, and the status of the creditors' claims. The Peace Court will then try to achieve a pre-judicial compromise, but this stage has had a low success rate in practice. The Peace Court, thereafter, issues a preliminary judgment that suspends all enforcement actions against the debtor and orders the way and amount of instalments to be paid until the hearing date. The Peace Court's final order sets out a binding adjustment of the debtor's debts. restructuring agreements regarding the financial restructuring of the debtor, combined with operational restructuring of the debtor, on the basis of a business plan and a management team approved by the participating lenders. Such agreements include various components, such as (partial) debt-to-equity conversion, the refinancing of the debt that is agreed as sustainable (by the debtor's business and on the basis of the approved business plan), the taking of a new enhanced participating lenders' security package and new working capital financing, for supporting or restarting the debtor's operation and growth. According to the debtor's financial position and type of business, restructuring may include negotiations with the employees and suppliers and agreement on certain payment arrangements in respect of outstanding amounts, to enable the debtor's stable operation. The above transactions would ideally take place with the participation of existing major shareholders, in the form of new equity contributions (a component that has been quite limited in Greece up until now) or of an investor capable of enhancing further debtor's management efficiency, capital structure, and credibility in the Greek and international market. The new amendments to the Bankruptcy Code categorise Greece as an even more 'creditor-friendly' jurisdiction than before. The right of creditors to submit a pre-pack deal for ratification, without the debtor's consent, in the case of present cessation of payments, the limitation of the available deadlines as well as the right of the special mandator to substitute shareholders or stakeholders that deny their presence or vote for decisions that are required under the pre-pack deal are major provisions that enhance the efficiency of the restructuring process and disregard any act that could jeopardise the operation of the entity in a way that promotes both creditors' and society's interests. Moreover, financial assistance to companies is provided mainly by the banks, which enjoy multiple ways of security measures and a privileged enforcement, in case of insolvency. A bank providing a loan will take a mortgage on the company's immovable property or a fixed or floating charge on its movable property, particularly on its inventory and equipment. A very important amendment concerns the priority of those claims that arise from financing of the entity in connection to a restructuring or reorganisation plan. Such claims are now the top priority and must be satisfied in full. Thus, banks that in most cases provide such financing are fully protected and satisfied, under the new Bankruptcy Code. In fact, following the announcement of the creditors' claims, within one month21 of the publication of the court's decision and their verification by the judge rapporteur and the insolvency practitioner, within one month and granted that a reorganisation plan has not been concluded, the insolvency practitioner commences the realisation of the company's assets (unsecured and secured). First in priority are creditors with general preferred privileges.22 The holder of the security in a specific asset of the company, whether immovable or movable, has a specific privilege (second class) and may be satisfied after the general preferred privileges. The third (last) class of priority includes unsecured creditors, who are satisfied after general and specific privileges. Nonetheless, before payments to any of the aforementioned classes, bankruptcy expenses, expenses concerning the management of 'non-exempt' property23 and claims of collective creditors24 must be paid in full. Moreover, if the three priority classes coincide, the proceeds are separated as follows: after the general preferred creditors who have granted financing, goods or services in connection to the restructuring or reorganisation plan receive full payment, then the rest of the general creditors receive 25 per cent of the proceeds, special preferred creditors receive 65 per cent and unsecured creditors receive 10 per cent. In Greece, the law sets out two different categories of the directors' duties: the first category concerns the payment of the entity's tax liabilities and social security contributions, while the second category concerns the initiation of the bankruptcy proceedings. With regard to the first category, in case the entity fails to withhold, collect or pay income tax, VAT, or its respective share of social security contributions and any surcharges, the directors, administrators, executive managers and directors, as well as syndic or bankruptcy trustees (now insolvency practitioners) of a legal entity, are rendered jointly and severally liable for payment of such taxes and contributions.25 This joint and several liability arises at the date of liquidation or merger or acquisition of the liable company. It should be noted though, that in the case of non-payment of withholding taxes (VAT, etc.) and social security contributions, the liability extends to all directors, administrators, etc., for claims arisen prior to and during their respective office. A significant provision that should be mentioned is the extension of joint and several liability,26 arising from all due taxes, to shareholders of the company who hold at least 10 per cent of the company's paid-up share capital,27 within three years prior to dissolution. The second category of duties refers to the prompt and timely initiation of the bankruptcy proceedings by the company's directors. The Bankruptcy Code envisages the joint liability of directors28 as well as of those who exercised undue influence on them, in case they fail to promptly file a bankruptcy petition, within 30 days of the date that there is present inability of the company to pay its liabilities as they become due. Such liability entails the restitution of creditors for damages arising from the reduction of the insolvency proceeds. The importance of the bankruptcy rules, in terms of social and financial consequences, is also evident by the establishment of criminal liability against the company's directors30 if they defraud creditors, conceal or fraudulently transfer assets of the company, dispose of inventory at very low prices, make false declarations or generally diminish the value of the company's assets. Fraudulent exploitation of the entity's assets is also avoided through the annulment of specific transactions that took place in the statutorily determined suspect period. The Bankruptcy Code distinguishes between transactions that must be annulled and transactions that could be annulled. imposition of security measures on the entity's assets for preexisting debts, when the entity had not undertaken such obligation or for new debts arising from a novation agreement. On the contrary, the insolvency practitioner may proceed32 with the annulment of transactions, whereby the other party acted in bad faith, knew of the company's cessation of payments and that such transaction was detrimental to the creditors' interests. the granting of security by special purpose vehicles (SPVs) or other third parties in favour of banks, or other third parties to secure claims against the SPV, acting within the scope of a public-private partnership (PPP) agreement, according to Law 3389/2005. The long-term financial and social distress of Greece highlighted the importance of the Bankruptcy Code and the need for its deep reform in order to restrain or at least reduce the serious impact of this crisis on enterprises, employees and employment. Thus, the Bankruptcy Code was recently updated by virtue of Law 4446/2016, which focuses on providing a second chance to honest entrepreneurs, enhancing the insolvency proceedings to avoid unnecessary delays and costs and enhancing the restructuring procedure in a way that preserves value and is beneficial for all stakeholders. These modifications are in alignment with the principles set out in the Commission Recommendation of 12 March 2014 on a new approach to business failure and insolvency,35 which promotes the restructure of economically viable but distressed businesses at an early stage and maximises the benefits for all stakeholders. These principles pervade the new provisions of the Bankruptcy Code. The continuous changes to the Bankruptcy Code prove that national legislators are vigilant about the current needs of the market, the necessity to interfere efficiently in the operation of distressed businesses and the improvement of the corporate rescue framework. The recent amendments demonstrate a greater coherence and an increased efficiency in these rules that offer more opportunities and reduce costs and time loss. Since 2015, the Bankruptcy Code provided for a new role: the insolvency practitioner. The insolvency practitioner is responsible for undertaking the duties of the syndic or bankruptcy trustee, mediator, special agent and special liquidator, as these duties are set out in the Bankruptcy Code. The profession of the insolvency practitioner is now regulated by virtue of Presidential Decree 133/2016, according to which a natural person can be appointed as an insolvency practitioner, granted that he or she has succeeded in the relevant national exams and has obtained the required licence. In order to participate in these exams, the natural person must have exercised the legal or audit or accountant of class A profession for at least five years. The insolvency practitioner shall exercise his or her duties with integrity, independence, honesty and professionalism and shall be liable for any wrongdoing. Personal liability is attached only in case of wilful misconduct or gross negligence. Liability under the provisions of the tort law is not excluded. Moreover, the insolvency practitioner is supervised by the Insolvency Administration Committee, which is also responsible to keep a register of accredited insolvency practitioners, while the Disciplinary Board shall be responsible to monitor the insolvency practitioner's appropriate conduct and to impose the statutory disciplinary measures in the event of misconduct. The new Bankruptcy Code has simplified the restructuring procedure and introduced shorter and more internal proceedings, as explained below (see Section IV.ii). The new Bankruptcy Code provides for two basic amendments regarding the debtor's duties: (1) the first concerns the duty of the debtor to submit along with the bankruptcy petition his or her financial data and a certificate witnessing the amounts of his or her debts, issued by the state. These additional documents shall help the court to have a more accurate picture of the debtor's financial situation; and (2) the second concerns the appointment of the debtor as a manager of the entity's assets (along with the insolvency practitioner), regardless of whether he or she filed for a bankruptcy petition. In fact, the only criterion is whether such appointment in favour of the creditors' interests. The infrequent use of the creditors' committee, which was entrusted to monitor the bankruptcy proceedings and assist the insolvency practitioner's duties resulted in its abolition. Thus, the creditors' committee is no longer one of the bankruptcy's organs. Moreover, the duties of the judge rapporteur have been upgraded. As of today, the judge rapporteur is responsible for deciding upon conflicts between the creditors, granting his or her consent for specific actions, such as sale of real estate property, supervising the proceedings during the auction of the business as well as convening the creditors' assembly, following a request by the insolvency practitioner or creditors representing 20 per cent of the total claims to decide upon the sale of the business either as a whole or in part. On the other hand, the board of directors or other management body37 are liable if they fail to promptly file a bankruptcy petition within 30 days of the date that the entity is unable to pay its liabilities as they become due. Such liability entails the restitution of creditors for damages arising from the reduction of the insolvency proceeds. Similarly, joint liability is attached to the entity's directors or management if the initiation of the bankruptcy proceedings is a result of a fraudulent or grossly negligent act. In general, the deadlines38 of the insolvency procedure are shortened as follows: (1) the deadline for filing an appeal against the orders of the judge rapporteur is now 10 days from the issuance of such orders (previously 20 days); (2) the deadline for the submission of the report by the insolvency practitioner is now five days (it was previously 10 days) prior to the creditors' assembly and must be published in the Bulletin of Judicial Publications of the Jurists' Pension Fund; (3) the deadline for the convention of the creditors' assembly by the judge rapporteur is now five days (it was previously 10 days) prior to such meeting and must be published in the Bulletin of Judicial Publications of the Jurists' Pension Fund; and (4) the deadline for the convention of the creditors' assembly by the judge rapporteur is now 10 days (it was previously 20 days) following verification of the their claims and the deadline for informing the debtor and insolvency practitioner about such convention is now three days (it was previously five days). By virtue of Law 4446/2016, the priority of claims has changed again. Financiers of the troubled entity are given motives to continue investing their money, as financial facility is in the first rank of general preferred privileges, whether the restructuring or reorganisation plan is ratified or not and shall be satisfied in full prior to any other payments. This privilege applies also to financing granted during negotiations up to six months prior to the filing of the restructuring or reorganisation plan, as long as this privilege is explicitly provided in such plans or financing agreements. Furthermore, by virtue of the very recent Law 4512/2018, the priority of claims has been rearranged. According to Article 177 of Law 4512/2018, if, following the enactment of the Law there are entirely new claims that will be secured with assets that do not bear any encumbrances up to that date (of the enactment) then employment claims existing prior to the date of the bankruptcy declaration and concerning due salaries up to six months shall have super-priority for an amount up to the minimum wage provided for an employee above 25 years old multiplied by 275 per cent. This super-priority is calculated per employee and per month for the aforementioned six-month period, following the payment of legal costs, costs for the management of the bankruptcy property and other claims arising from the bankruptcy's works. After the satisfaction of this super-priority, then the priority of claims is as follows: (1) financial facilities provided throughout the restructuring or reorganisation period; (2) special preferred claims; (3) general preferred claims; and (4) unsecured creditors. The new Bankruptcy Code provides for important amendments to the liquidation of small companies. The law identifies small entities as those that meet at least two of the following criteria: (1) have total assets amounting up to €150,000; (2) have a turnover amounting up to €200,000; and (3) employ up to five people on average. If two of the aforementioned conditions are met according to the write-downs of the inventory, the court declares the initiation of liquidation of the small entity. Announcement of the creditors' claims must take place within one month of the publication of the court's decision. Any delay in such announcement does not allow for a second chance and the creditor may not file a third-party objection before the court for the judicial verification of his or her claim, as provided in the regular insolvency process. Sales of assets that are subject to deterioration, or undervaluation, or if their preservation is costly can proceed without the consent of the judge rapporteur. Prior to the creditors' union, if the business is unlikely to operate or be sold entirely, then the insolvency practitioner may proceed with the sale of movable property and inventories following consent by the judge rapporteur. In this case, the debtor must be informed about such sale in order to raise any objections within three days. This obligation is not required after the creditors' union. Sales of immovable property take place in accordance with the regular insolvency procedure. If the first auction and its repetition within two weeks are fruitless, then the judge rapporteur may order the sale of the immovable property without an auction, following such request by the insolvency practitioner. In compliance with the Commission Recommendation C(2014) 1500, the new Bankruptcy Code gives a second chance to honest entrepreneurs. In fact, the court, after reviewing the judge rapporteur's report on the assessment of the causes and circumstance that led to bankruptcy and after hearing the insolvency practitioner on the same matters, may excuse the debtor, if he or she cooperated in good faith with all the parties involved, during the insolvency procedure. If the insolvency has been completed with the sale of the business, then the debtor may request to be excused and the court decides on the same aforementioned basis. If the debtor is excused, he or she may not be arrested and any forfeiture from rights is suspended. For an entity, the final ratification of the reorganisation plan or the conclusion of the insolvency owing to full satisfaction of creditors are reasons for its revival. Moreover, within two years of declaration of bankruptcy, the debtor may file for a discharge of debts and the court may discharge him or her for any outstanding claims if he or she can also be excused. This order must be issued within 60 days of the hearing. Of course, the debtor may not be discharged for claims arising from his or her wilful misconduct or gross negligence. In case the insolvency is completed with the ratification of a reorganisation plan, then the debtor is automatically discharged, unless otherwise provided therein. Finally, if the debtor is excused and three years pass from the declaration of bankruptcy, then the debtor is automatically discharged of his or her debts. By virtue of Article 24 of Law 4549/2018 'Provisions for the Completion of the Agreement on Financial Objectives and Structural Reforms – Medium-term Financial Strategy Framework 2019–2022' (Government Gazette B' 105/14.06.2018), a second chance is also given to individuals that have not been declared bankrupt yet, but have already been registered with the Bankruptcies Registry by order of the bankruptcy court, following the rejection of a petition in bankruptcy, given that it was highly speculated that their belongings would not be sufficient for the payment of the costs of the bankruptcy procedure. In accordance with Paragraph 5 of Article 167 of Law 3588/2007, which was added by virtue of Law 4549/2018, the non-bankrupt debtor or individual that has been registered with the Bankruptcies Registry has the option to file a petition before the competent court in order to be declared excusable, which constitutes condition for the discharge of debts. The judgment on whether the debtor is excusable or not is based on the review of the causes and conditions of the case and the comments of the creditors. Further, based on Paragraph 2 of Article 168 of Law 3588/2007, which was added by virtue of Law 4549/2018, a non-bankrupt debtor or individual that has been registered with the Bankruptcies Registry, according to the above, may file a petition for discharge of debts after the elapse of three years from his or her registration with the GEMI (General Registry of Commerce) and the Bankruptices Registry. It is noted that the above provisions are also applied to non-bankrupt debtors that were registered with the Bankruptcies Registry since 1 October 2016 onwards, and to cases pending when these entered into force (i.e., 14 June 2018). Therefore, any relevant petitions for the discharge of debts of non-bankrupt debtors or individuals may be filed from 1 October 2019. NPLs shall be: (1) managed either by special NPL asset-management companies limited by shares (with special and limited scope of business) that operate in Greece or in the European Economic Area; or (2) purchased and transferred to companies limited by shares that operate in Greece or in the European Economic Area or in countries outside the EU42 and part of their business scope is to purchase and acquire claims from loans or credit agreements. The regulation of NPLs sets out the requirements for the establishment and operation of the eligible companies. For a special NPLs asset management company to acquire permission to manage NPLs (and any collateral immovable property), it must file with the Bank of Greece, among others, its article of association, the identity of any and all natural or legal persons that have directly or indirectly a special participation in the company, the identity of any and all natural or legal persons that exercise control in the company, a business plan including the company's projected actions, strategy and available resources, a detailed report of the methods and procedures to be adopted for such management and questionnaires that assess its ability and suitability to deal with the restructuring of NPLs. The Bank of Greece shall grant the required licence within two months of the submission of the respective petition. Furthermore, a management company must have a minimum share capital of €100,000, and if it wishes to finance new loans or credit agreements, a share capital of €4.5 million. The acquisition of NPLs, on the other hand, does not require a specific licence but the acquiring company must have signed a management agreement with a special NPL asset-management company. The sale and transfer of such loans shall be effective only upon delivery of a written extrajudicial invitation to the debtor (and guarantor) to settle his or her debt within 12 months prior to such sale and transfer, according to a debt settlement agreement in writing. The acquisition is effective against third parties following registration of the agreement in the books of the Registry of Pledges and notification of the assignment to the debtors and any guarantors. It should be noted that the sale and transfer of NPLs shall have an income taxation on the goodwill, borne by the acquiring company, while both management and acquisition agreements shall be subject to a VAT taxation of 24 per cent. Stamp duties are explicitly excluded for the agreements executed by the Special NPLs Asset Management Company. Finally, Law 4472/2017 introduces a major provision according to which those persons who are responsible for supervising and or managing: (1) public property (including all kinds of state property or property of state-owned entities); or (2) property of a credit or financial institution are immune from any criminal or civil liability arising from their actions or failure in connection to the restructuring or discharge of loans, claims or charges, within the scope of the Bankruptcy Code or the law on the extrajudicial debt settlement procedure or the law on financially distressed individuals and households or the law on special liquidation of credit institutions or the law on the NPLs, and in accordance with the provisions of their internal regulations and guidelines, rules and procedures and applicable laws. These actions or failures to act must also aim to settle or restructure debts or assist the operation of the business and should not deteriorate the financial situation of the entity in comparison to that which would result from a liquidation procedure. Until 2014, municipalities and communities (M&Cs), as entities of public interest, could not declare bankruptcy. But the long-term financial crisis challenged their economic independency and sustainability and led to the introduction of Article 174 of Law 4270/2014 on the Restructuring of Municipalities and Communities. The idea of this Law is to closely watch the financial performance of M&Cs, alert their management bodies and impose restructuring measures in accordance with a respective plan. The Financial Independency Observatory of M&Cs (the Observatory) is entitled to report to the Ministry of Internal Affairs as well as the M&Cs, the latter's deviation of more than 10 per cent from budgetary targets and provide it with guidelines and methods to overcome such deviation. If the Observatory concludes that an M&C is incapable of drafting a preliminary balanced budget or fraudulently records false financial data, it is also entitled to draft a report of its financial situation and propose restructuring measures, in accordance with a restructuring plan. Moreover, M&Cs may apply for a voluntary restructuring,43 which is reviewed (rejected or approved) by the Observatory and the Minister of Internal Affairs. granting of a loan by the Deposits and Loans Fund. In 2016, one of the largest supermarket chains in Greece was put under a restructuring procedure because of its financial distress. This case received great press coverage, since it was the first case of the specific industry and with financial and social interests of various stakeholders. The pre-pack deal provides for the establishment of a new company (NewCo), under the trade name 'Hellenic SuperMarkets Sklavenitis SA' in which Marinopoulos shall transfer assets amounting to approximately €715 million, liabilities amounting to approximately €1 billion, all its commercial claims and all its fixed assets. Sklavenitis SuperMarkets SA (another major player in the industry) shall acquire the NewCo and contribute in cash, through a share capital increase, an amount of approximately €125 million. According to the pre-pack deal, which was ratified by the court, the restructuring plan envisages four basic components: (1) haircut of some claims; (2) extensions of credit line by the banks; (3) increase of the number of total instalments for claims towards the state and the Social Security Institution; and (4) specific provisions for the employees. In particular, claims of both secured creditors and unsecured creditors-suppliers of Marinopoulos (the latter's claims amounting to approximately €647 million) shall be reduced by up to 50 per cent. Apart from Alpha Bank, which accepted a haircut of up to 20 per cent, banks (Alpha Bank, Eurobank, Piraeus Leasing, National Bank of Greece and National Leasing) shall receive full payment of their claims, amounting to approximately €196 million, within 20 years, after a five-year grace period and in 15 unequal instalments with interest, following a capitalisation of any due interest amounts, which shall take place at the execution date of the pre-pack deal. Claims of the state and the Social Security Institution shall be paid in full and in 250 equal and interest-free instalments. The banks agreed to extend the credit line of Marinopoulos with an amount up to approximately €55 million and provide a credit line to NewCo up to approximately €352 million. Apart from the share capital increase in the NewCo, Sklavenitis SuperMarkets SA and Marinopoulos Bros. Holdings SA shall also provide an interim financing of up to approximately €15 million and €10 million accordingly. It is noted that all existing employment, leasing and tenancy agreements shall be transferred to the new company. Moreover, any and all administrative licences, trademarks, permissions of use, inventory, equipment and furniture are transferred to the new company. The restructuring of Dias Aquaculture (Dias) was one of the first that occurred in the fish farm industry. Dias applied for a pre-pack deal, which included a transfer of Dias' business to Selonda Aquaculture SA. In particular, Dias contributed in kind its total assets, amounting to €69 million, and part of its liabilities, amounting to €29.6 million, to Selonda's share capital. A part of Dias' liabilities, which constituted 81.95 per cent of its total liabilities would not be contributed to Selonda; instead, it remained within Dias's financial statements and was covered with the acquisition of 41,261,980 shares issued by Selonda, in accordance with its share capital increase of €12.4 million. The newly issued shares were subsequently transferred by Dias to its creditors, on a pro rata basis, for their satisfaction. It should be noted that Selonda itself had also applied for a restructuring plan, which resulted in a haircut of its debts held by the banks, amounting to €50 million. Selonda is now managed and operated by a new management appointed by the participating banks, which is seeking an interested investor to buy out Selonda. As normal methods of restructuring are not enough to save distressed companies in the Greek crisis environment, debtors and their creditors are led to more complicated solutions, depending on the nature and size of their business. In particular, large companies that were listed in the Athens Stock Exchange preferred to go private, through acquisition by an interested investor. A greater percentage of medium-sized companies resorted to techniques such as debt-to-equity conversion and debt-forgiveness agreements. In such cases, the banks, which usually hold the largest percentage of their debts, take over their management, proceed with drastic restructuring measures and then search for an interested buyer. Restructured companies – especially those with increased exports – are able to obtain new working capital financing. More advanced tools like a debt push-up, or even the creation of new group structures with lower debt levels or the consolidation of existing players in each sector, are also used to rescue viable businesses and recover part of the existing debt. The industries of construction, textiles, electric appliance stores and supermarkets have suffered the most severe financial losses within the Greek market. The reasons for such distress can be explained by the fact that they are all capital-intensive industries, with high running costs, squeezed profit margins and, in addition, are overleveraged (through abundant financing provided to them before the crisis). Profit margins have decreased even more now that companies have limited access to working capital finance. Moreover, the recent changes in the income tax code, the real estate property taxation and the increase of VAT up to 24 per cent have significantly diminished the spending capacity of Greek consumers. A long-awaited procedure was recently legislated; the extrajudicial debt settlement. According to Law 4469/2017, any natural or legal person may file a petition for an extrajudicial debt settlement provided that their total debts to the state, social security contributions and banks (default of payment for at least 90 days) or claims from a payment order issued by the court, as of 31 December 2016 amount to €20,000 at least. In case such person or entity has applied for or has begun a pre-bankruptcy or post-bankruptcy procedure or special administration or liquidation or such person or entity has been finally convicted for tax evasion or money laundering then it is not eligible for the extrajudicial debt settlement. Moreover, the person or the entity must have had for at least one of the last three fiscal years before the petition: (1) a positive EBITDA, if it uses a single-entry accounting system; or (2) a positive EBITDA or positive net position, if it uses a double-entry accounting system. The petition must be submitted before 3 December 2018 via the electronic platform of the Special Secretariat (Directory) of Private Debt Management. The petition must be accompanied by various documents, such as a creditors' list, a list of all assets and any encumbrances, any affiliated persons, financial statements and various certificates. Thereafter, the special secretariat appoints a mediator who shall communicate with the debtor and the creditors and shall coordinate the procedure. Continuation of the procedure is subject to the participation of creditors, representing at least 50 per cent of the total claims (not including creditors that are affiliated with the debtor). The law provides that a joint decision by the Ministry of Finance, Ministry of Economy and Development, Ministry of Labour, Social Security and Welfare can promulgate that for debts between €20,000 to €50,000, the procedure is automatic, meaning that the creditors have to choose among predetermined solutions. Upon notice of the mediator to the creditors to participate in the extrajudicial debt settlement, all enforcement actions (against claims set under the settlement) are suspended for a period up to 70 days. An extension of this period can be granted by the court, following petition of the debtor and approval by the majority of the creditors, for a period up to four months. The debtor and the majority of the creditors shall appoint an expert to draft a restructuring plan, which may then be ratified by three-fifths of the represented creditors, including two-fifths of the represented secured creditors. Finally, the restructuring plan may be submitted before the court for ratification. Since its implementation in 2011, the pre-pack deal has a distinctive position within the scope of bankruptcy law. First of all, it offers a good chance to the interested parties to find a mutually acceptable solution. The new Bankruptcy Code provides that the submission of the pre-pack deal is the only way to initiate the restructuring procedure, as it safeguards time and avoids delaying tactics by debtors. The recent changes that extend the circle of persons that can file for a restructuring procedure, allow creditors that represent at least 60 per cent of the total claims, including 40 per cent of the secured creditors to file a pre-pack deal without the debtor's consent, if the debtor is in permanent cessation of payments, demonstrate a clear legislative intent to accelerate the restructuring procedure and facilitate further business rescue. There have been some reservations on the pre-pack deal, mainly focusing on potential 'cloudy' negotiations, the partial or significantly diminished satisfaction of unsecured creditors or the impairment of the entity's value. Despite those reservations, the case of the pre-pack deal was and continues to be successful in Greece, overturning those who believed that debtors and creditors cannot reach an amicable solution. The point that a restructuring plan not only promotes the interests of the creditors but mainly helps an entity stay alive, pay taxes, recruit and make a business plan, is well received. It should be noted that in a country where bankruptcy was considered a social stigma for many years – the ultimate nightmare of a successful businessman – the idea of the pre-pack deal demolished many prejudices. The legislator has given room to the interested parties to find a way out and act in both personal and public interests. The principles of unity and universality44 pervade the rationale of the Greek law,45 which is applied in insolvency proceedings that are initiated in Greece. The EU Regulation 1346/2000, and all later amendments, were integrated to the Greek insolvency laws in May 2002. Similarly, the UNCITRAL Model Law on Cross-Border Insolvency was implemented almost in its entirety through Law 3858/2010. Nonetheless, Greek jurisprudence on international insolvency cases is very poor. In fact, there are two main cases46 that were successfully tried before the Greek courts, regarding the recognition of a foreign decision and the initiation of secondary bankruptcy proceedings. Many provisions of the EU Regulation have superseded any bilateral or multilateral agreements on insolvency proceedings or recognition of foreign decisions. Unlike France and Italy, Greece has not signed any respective agreements, and thus, the EU Regulation 1346/2000 remains in full force. According to Article 81 of the Treaty of the European Union and Articles 7 and 35 of Law 3858/2010 on Cross-Border Insolvency, the Greek courts must cooperate with foreign courts or foreign insolvency administrators directly or through such administrators. Similarly, the Greek courts are entitled to communicate directly, request information or judicial assistance from foreign courts or foreign insolvency administrators or coordinate cross-border insolvency proceedings with other participant Member States. Although these provisions stand for a considerable time period, no respective cases have been reported. A recent development in the European Union concerns the abolishment of the EU Regulation 1346/2000 on 26 June 2017. Any and all insolvency proceedings commencing thereafter shall be governed by the EU Regulation 2015/848, as amended by EU Regulation 2017/353. Many novelties of the EU Regulation 2015/848 have already been implemented in the Bankruptcy Code through Law 4336/2016, such as the introduction of the insolvency practitioner and the rescue of viable companies, while the Commission's recommendations C(2014) 1500 have also been implemented by virtue of Law 4446/2016, including the expedited restructuring procedures and the rules for granting a second chance to honest entrepreneurs. Other novelties, such as the registry of insolvency, the interconnection with the respective registries of other Member States, publication to another Member State and the cooperation of insolvency practitioners both in main and secondary insolvency proceedings may be either implemented through further amendments to the Bankruptcy Code, or the new regulation shall be directly applied to cross-border insolvency cases. The amendments to the restructuring procedure follow the trends of the European law and the current practices and needs of the Greek market. For the first time, creditors are also entitled to file a pre-pack, without the consent of the debtor, if the debtor is in permanent cessation of payments. This is a crucial provision, as creditors have a chance to rehabilitate entities with growth potential, despite their permanent cessation of payments. It is likely that the law will extend this right also in case of debtors with imminent cessation of payments, as this will help even more creditors who are 'trapped' owing to misleading practices by their debtors. It should be noted that a proposal to extend the scope of this procedure as aforementioned cannot be confused with the bankruptcy procedure, in which case only the debtor can file a bankruptcy petition owing to imminent cessation of payments. This distinction lies in the heart of restructuring; creditors granting a second chance to businesses that are viable and can grow further, with a good business plan, if they are 'released' from their bad management or inefficiencies of their owners. Moreover, the abolishment of the special liquidation procedure as mentioned above, highlights the importance of the special administration procedure (as described in Section II.i). In order for special administration to play the role required today, some amendments should also take place. These amendments refer to: (1) the provision of the debtor's right to file for a special administration procedure, as now can be initiated only by creditors; and (2) the extension of the special administration's scope in order to include imminent cessation of payments as well as probability of insolvency as events or conditions for the initiation of such procedure. 1 Dorotheos Samoladas is a partner and Christina Kalogeropoulou is an associate at Sarantitis Law Firm. 3 Article 125 of the TFEU. 4 Executive Committee Act 118/19.05.2017 'Framework of establishment and operation of credit servicing firms (Law 4354/2015) – Replacement of Executive Committee Act 95/27.5.2016'. 5 Article 65 Paragraph 2 of Law 4472/2017. 8 As amended by Laws 3858/2010, 4013/2011, 4055/2012, 4072/2012,4336/2015, 4446/2016,4472/2017, 4512/2018 and 4549/2018. 9 According to the new Paragraph 4 of Article 5 of the Bankruptcy Code, the debtor must also submit his or her financial statements, if they exist, for the last available fiscal year as well as certificates witnessing the amounts of his or her debts, issued by the state. 10 This criterion was recently added, by virtue of Article 1 Paragraph 1 of Law 4446/2016. 11 Initially, the existence of assets that could cover the bankruptcy's expenses constituted a negative condition, namely a reason for the court to reject the respective petition. Now, according to Article 1 Paragraph 1 of Law 4446/2016 it has become a positive condition to accept the petition, thus expediting the procedure and rendering it more efficient. 12 The date of the meeting shall take place within four months of the declaration of bankruptcy. 13 Judge rapporteur means the judge that is in charge of a particular case, incumbent to present the insolvency case before the general meeting of the court. 14 As amended by virtue of Article 1 Paragraph 7 of Law 4446/2016. 15 Article 99 of the Bankruptcy Code. 17 Decision No. 5461/2014 of the Single Member Court of Appeals of Athens. 18 The old provision is the Legislative Decree 400/1970, as amended by the Presidential Decree 332/2003. 19 As amended by Article 20 of Law 4474/2017. 20 Article 2 of Law 4335/2016. 21 Such deadline can be extended by the judge rapporteur for up to two months, only in exigent circumstances, because of the amount and nature of the claims as well as the number of the creditors. Article 93 Paragraph 1, Law 3588/2007. 22 General privileges, mainly, include: financing of the debtor for its continuing operations, claims arising from the contribution of goods and services to the debtor, based on the reorganisation plan or the restructuring plan, even those that were granted six months, in maximum, prior to the submission of the pre-pack deal; if the debtor is an individual (an insolvent merchant); costs and expenses for his or her funeral, hospitalisation, daily necessaries; claims from dependent employment agreement, periodical fees for services that arose within two years prior to the filing of bankruptcy, lawyers' fees, value added tax claims, taxes, pension funds' claims; and any claims of the state and the prefectures. 23 'Non-exempt' property refers to the bankrupt company's assets as of the date of the bankruptcy's declaration. 'Exempt' property refers to such company's assets that are statutorily exempted from liquidation, such as necessaries, family rights, the debtor's personality and his or her ability to work, rights that are strictly connected to his or her person (such as the right to use his or her name, to accept or waive inheritance rights, etc.). 24 Collective creditors are those creditors whose claims arose out of the insolvency practitioner's actions in connection to the bankruptcy proceedings. 25 Article 50 of Law 4174/2013 and 31 of Law 4321/2015. 26 This extension is limited to amounts received by the shareholders as dividends or as payment in kind or cash and only for those claims that arose during acquisition of the shares. 27 Listed companies are exempted from such liability extension. 28 Article 98 Paragraph 1 of Law 3588/2007. 29 Article 98 Paragraph 2 of Law 3588/2007. 30 Article 176 Paragraph 1 of Law 3588/2007. 31 Article 42 of Law 3588/2007. 32 Article 43 of Law 3588/2007. 33 Article 44 of Law 3588/2007. 34 Article 45(e) of Law 3588/2007. 35 European Commission Recommendation C(2014) 1500 http://ec.europa.eu/justice/civil/files/c_2014_1500_en.pdf. 36 Article 80 of Law 3588/2007. The insolvency practitioner is similarly liable for agents used, if he or she was not entitled to appoint them. Otherwise, the insolvency practitioner's liability is limited to the appointment of such person and the directions provided. 37 Article 98 of Law 3588/2007. The same rules apply to those people who exercised undue influence on directors and managers, holding them jointly liable. 38 Articles 60, 70, 82 and 84 of Law 3588/2007, respectively. 39 Article 154 of Law 3588/2007. 40 Deloitte, Deleveraging Europe 2016–2017, page 32; https://www2.deloitte.com/content/dam/Deloitte/uk/Documents/corporate-finance/deloitte-uk-deleveraging-europe-2016-2017.pdf. 41 Law 4354/2015, as recently modified by Article 70 of Law 4389/2016, Article 4 of Law 4393/2016 and Article 48 of Law 4472/2017. 42 Companies established in countries outside of the EU may establish a branch in Greece provided that their registered seat is not in a non-cooperative country or in a country with a preferential tax regime. 43 So far, two municipalities have applied for restructuring: the municipality of Salamina and Gortynia in Crete. 44 Unity and universality mean that the insolvency procedure, whether of individuals or legal entities, is one and the applicable law is that of the jurisdiction, where such procedure was initiated and any creditor, regardless of his or her residence, may participate therein. 45 Both the Bankruptcy Code and the Civil Procedure Code incorporate these principles. In particular, Article 780 of the Civil Procedure Code provides the requirements, regarding the recognition of foreign judicial decisions that: (1) the decision must apply substantive law, that according to the Private International Rules is applicable; (2) the decision must have been issued by the competent jurisdiction, in accordance with the substantive law of the jurisdiction applied; and (3) the decision must not be contrary to moral usage or public order. To the contrary, the EU Regulations 1346/2000 and 2015/848 provide for a more simplified recognition procedure, according to which the declaration of bankruptcy from the competent foreign courts is automatically recognised in other foreign courts, starting from the date of such declaration's legal effects. The only exceptions to the automatic recognition are those of public order and individual rights. 46 Decision No. 494/2014 of the Single Member Court of First Instance in Kos and Decision No. 437/2013 of the Multi-Member Court of First Instance in Athens.